The original BeagleBone launched in 2011 $89, then Beagleboard.org released an updated version with HDMI, a faster processor, and more RAM called BeagleBone Black for $45 in 2013, possibly as a competitor to the Raspberry Pi, and since then the price has bumped up to $55 because of a larger eMMC flash. 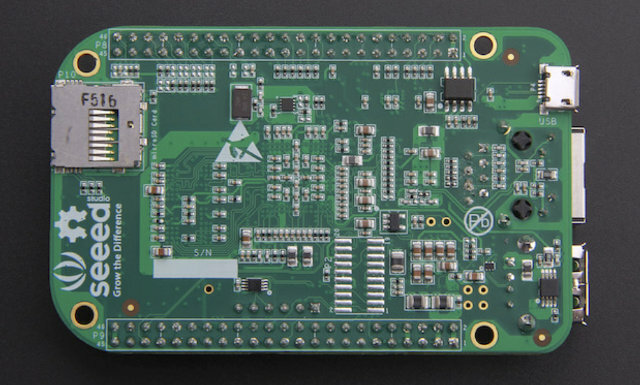 There’s now a new version – and a different color – with BeagleBone Green selling for $39 on SeeedStudio with shipping starting on August 20, 2015. “Beaglebone” Connectors – Power 5V, 3.3V , VDD_ADC(1.8V) 3.3V I/O on all signals, McASP0, SPI1, I2C, GPIO(69 max), LCD, GPMC, MMC1, MMC2, 7 AIN(1.8V MAX), 4 Timers, 4 Serial Ports, CAN0, EHRPWM(0,2), XDMA Interrupt, Expansion Board ID (Up to 4 can be stacked). Beside the removal of the micro HDMI port and HDMI framer IC, meaning you’ll need a CAPE for video and/or audio output, and the addition of Grove connectors, the DC jack was removed since it was rarely used, and the board is more commonly powered through the micro USB port, and they’ve replaced the mini USB port, by a more common micro USB port. But overall, the design is basically the same, and BeagleBone Green should be software and hardware compatible with BeagleBone Black, run the same Android, Debian, ArchLinuxARM, etc… images, and support the Capes already available for BeagleBone & BeagleBone Black. You can still use Beagleboard.org community resources to get support, but you can also check out BeagleBone Green Wiki hosted on SeeedStudio, and beside the price drop, one key advantage of the new board is support for 100+ Grove modules, on top of the capes. 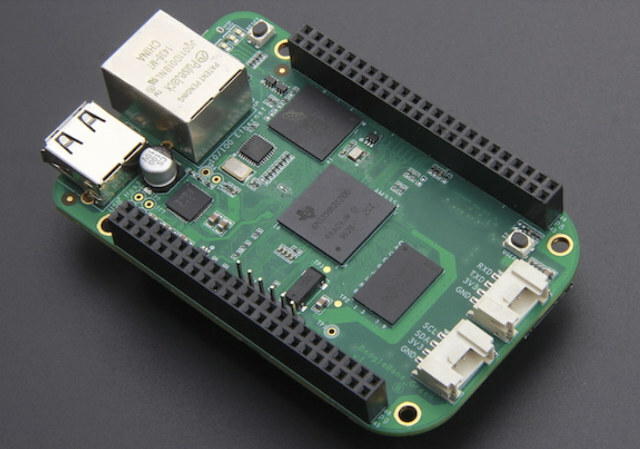 Like its predecessors, BeagleBone Green is also open source hardware, and relevant files can be found on BeagleBoard Hardware Design page. For more details, I recommend reading the System Reference Manual.